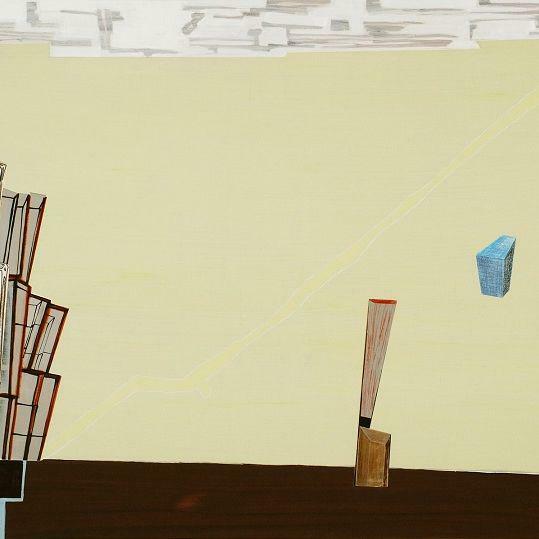 Frances Barth was born in 1946 in the Bronx, New York, and studied painting and art history at Hunter College, CUNY. She lives and works in New Jersey. She has exhibited her paintings widely in both solo and group exhibitions since the late 1960’s, and her work is represented in numerous public, corporate and private collections, including The Museum of Modern Art, The Metropolitan Museum of Art, The Whitney Museum, in NYC, The Dallas Museum of Art, TX, The Albright Knox Museum, Buffalo. Frances showed six of her paintings in the 2015 Venice Biennale at the Palazzo Grimani in "Frontiers Reimagined." Early in her career, Frances also performed with Yvonne Rainer and Joan Jonas in New York City in live performance and video/film. During the last ten years she has created two animations, a documentary, and a short b&w film set in 1947, while remaining always focused on her painting. For the past fourteen years she has also been working with animation and video. “End of the Day, End of the Day” was her first completed animation/video with dialogue (TRT: 09:34) shown as part of the Atlanta Festival of the Moving Image and in New York. In 2016 she finished a new animation with multiple characters and music called "Jonnie in the Lake," which showed at the New York Short Film Festival and won Best Animated Short, and also at The Sunrise Film Festival in Nova Scotia where it was nominated for Best Short. Frances completed the first video portrait of the painter Regina Bogat in 2013, which was shown at The Marfa International Film Festival in 2014, and the short film "No No Boy" in 2015 which was shown at SVA in NY. Frances has finished a new portrait/documentary video of Regina Bogat called "Regina B" in 2017. She is Director Emeritus of the Mt.Royal School of Art, Maryland Institute. Her awards include The National Endowment for the Arts grants in 1974 and 1982, a Guggenheim Fellowship in 1977, the Joan Mitchell Foundation grant in 1995, two American Academy of Arts and Letters Purchase awards in ’99 and ’04, the Anonymous Was a Woman grant in 2006, and the Pollock-Krasner Foundation grant in 2017. "Drawing in the Present Tense," Art Gallery, Parsons, New York City, (Traveling: North Dakota Museum of Art, Grand Forks; Illinois Univ., Normal Illinois. Gallery One, Toronto, Canada, "Inner Landscapes: 16xONE"
Graphic Novel, Color, 72 pages, 6"x9"
© Frances Barth 2016, released January 10, 2017 on Amazon and Barnes and Nobel. "In this singular abstracted land, six characters drive forward the story in "Ginger Smith and Billy Gee" by the painter Frances Barth. In the family of a graphic novel, but also like a graphic poem, this is a book in two acts and an Afterword, with interspersed dreams of the main character Ginger. It turns its focus cinematically on the darkly comic relationship developing between Ginger, a painter, and Billy, an aspiring writer, after Ginger is dumped by Billy's best friend. Four other characters contriibute to the richness of the story. Hiker 1 and Hiker 2 are like figures in a Greek Chorus commenting on the action and entering and leaving the story line, and Male and Female add a Freudian coda to the proceedings. This is a winsome and jaunty artist tale, humorous, poetic and symbolic. A full color book with all original drawings and text."